Cryptozoic Entertainment, leading creator of board games, trading cards, and physical and digital collectibles, and Warner Bros. Consumer Products, on behalf of DC Entertainment, today announced the release of the Harley Quinn Puddin’ Pop Statue at San Diego Comic-Con, July 19-22, followed by a full retail release after the convention. 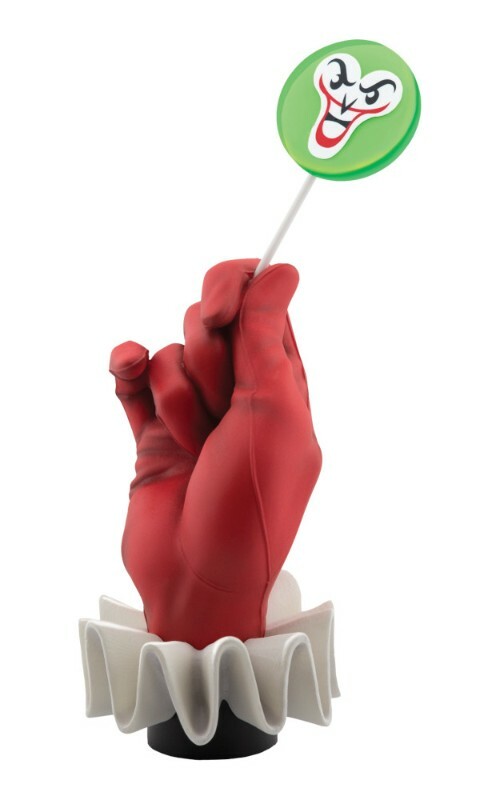 The second in Cryptozoic’s series of hand statues depicts Harley Quinn’s gloved hand holding a lollipop with The Joker’s face on it. The high-end statue measures about 6.25 inches tall, with the lollicop increasing the overall height to approximately 10 inches. The name of the collectible plays off Harley Quinn’s famous nickname for The Joker: “Puddin.’” Sculpted by Mana Studios, each statue is individually hand-numbered, includes a Certificate of Authenticity, and comes packaged inside a full-color closed box. The Harley Quinn Puddin’ Pop Statue will be available at Cryptozoic’s Booth #115 at San Diego Comic-Con and subsequently at retailers nationwide for a suggested retail price of $75. Are you headed to SDCC 2018? Let us know in the comment section below. Also, don’t forget to Like, Share and Subscribe to all things Constant Collectible so YOU can keep up to date with all the news and reviews from a world of GEEK CULTURE.